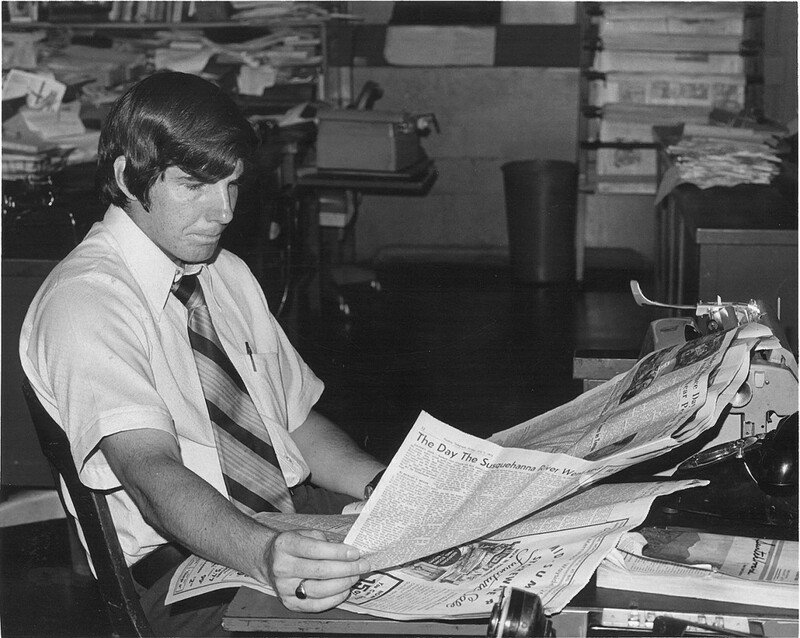 John Harrigan in the New Hampshire Sunday News section of the Union Leader newsroom in Manchester, sometime during the mid-1970s, working away. 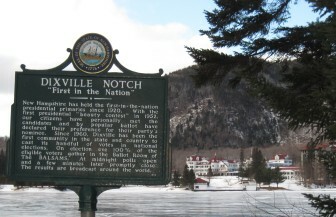 The first presidential primary I remember came almost half a century ago when, fresh from shoving boards around at the Lorden Lumber Company, I was a total rookie at the Nashua Telegraph, a 22,000-circulation afternoon daily. I’d been hired to learn darkroom wizardry and operate photo-engraving machines. I barely knew how to run the camera. Former Vice President Richard Nixon was squaring off in the New Hampshire primary against Nelson Rockefeller, Ronald Reagan and perennial candidate Harold Stassen. Nixon’s entourage was to stop at the Greenbriar Nursing Home to meet Richard Chaput, a quadriplegic who had accomplished wonders, including a couple of books. I got there in time to worm my way through the small Secret Service detail (times were simpler then) and get a shot of Nixon leaning over to meet a prostrate Chaput on a gurney. No sooner had I edged away than one of the agents tapped me on the shoulder. “The Vice President asks that you don’t make that shot,” he said. Nixon, all other stories aside, was a sensitive guy and didn’t like the idea of seeming to loom over and impose on and take advantage of a seemingly trapped Chaput; and instead, he graciously posed for a better shot of him kneeling to chat at head-to-head level. Nixon won the primary and picked Spiro Agnew as his running mate. Agnew came to town after the election for a more or less thank-you event, hosted by the city’s vibrant Greek-American community, and I went along with newsroom editor John Stylianos. “Mr. Vice President, how do you keep fit?” was Styli’s first question, a real softball. I remember Agnew’s incredibly slicked-back hair, like a helmet. I don’t remember his answer. I do remember effete snobs, and nattering nabobs of negativism. Two years later the statewide New Hampshire Sunday News hired me, and I was off to a glorious five years of having the run of the state, tracking down every off-beat photo-feature I could dream up, Walter Mitty-style, and covering weekend breaking-news events in and around Manchester. By then I’d seen two primaries and enough candidates coming to town to know the ropes. And now here we are in the middle of another first-in-the-nation primary, and it all seems so familiar. There’s the gaggle of candidates that needs thinning out, like carrots, which the New Hampshire primary tends to do. And now the show has come to town again, like a circus train unloading in the night. Iowa is back there in the Midwestern dust, its brief bask in the limelight gone almost before it began. “Iowa is only a sideshow,” I tell visiting media and anyone else who’ll listen. In my imaginary Iowa cartoon, they have a barker out there with straw hat and cane, shilling to attract attention. What’s a caucus, indeed? It’s not even a vote, for Pete’s sake. It’s a dull gathering of party pols — apparatchiks who go to party rubber-chicken dinners county by county all year long and then gather a week before New Hampshire’s real vote to literally go stand in a corner in some dank high school gym to indicate which candidate they might support. It’s as boring as watching corn grow. “This way to the main event!” barkers would be urging the crowd here in New Hampshire a week later. “Right here in the Big Top! The real deal! Brought to you here in New Hampshire, performing without benefit of a safety net for 50 years, it’s the First in the Nation Primary!